Chocolate and raspberry brownie with a chocolate and raspberry ganache and red lustred cocoa nibs. An indulgent chocolate brownie, topped with raspberry ganache and finished with red lustred cocoa nibs. 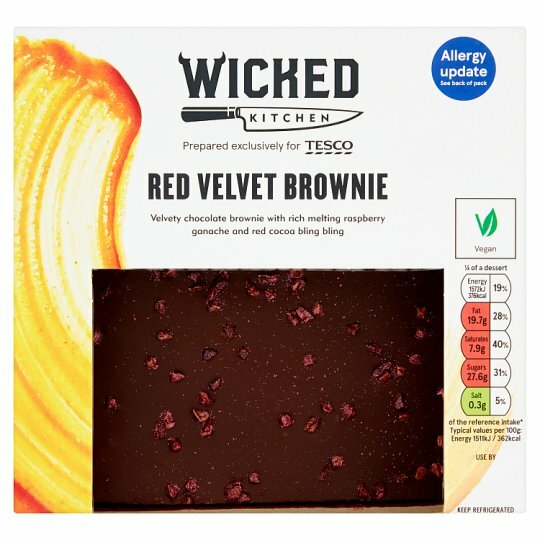 INGREDIENTS: Chocolate and Raspberry Ganache (28%) [Water, Cocoa Mass, Sugar, Cocoa Butter, Concentrated Raspberry Juice, Emulsifiers (Sunflower Lecithins, Soya Lecithins), Cornflour, Flavouring], Coconut Milk [Coconut, Water], Wheat Flour [Wheat Flour, Calcium Carbonate, Iron, Niacin, Thiamin], Sugar, Almonds, Partially Inverted Sugar Syrup, Raspberry (5%), Dark Chocolate (4.5%) [Cocoa Mass, Sugar, Cocoa Butter, Emulsifier (Soya Lecithins), Flavouring], Rapeseed Oil, Fat Reduced Cocoa Powder, Colour (Beetroot Red), Red Lustred Cocoa Nibs (0.5%) [Cocoa Nib, Colour (Iron Oxide)], Raising Agents (Disodium Diphosphate, Potassium Bicarbonate), Dextrose, Cornflour, Palm Oil. Instructions: From Chilled: Remove outer packaging. Place tray on a baking tray and bake. Leave to cool for 1 minute before serving. Instructions: From chilled: Remove outer packaging. Place tray on a microwaveable plate and heat on full power. Leave to cool for 2 minutes before serving. This product can be eaten hot or cold.